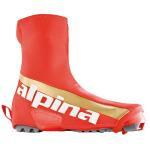 Alpina ACL Summer Classic Rollerkis Boot 2015 Special shoes for Rollerskiing. The ACL Summer can be used even on snow when temperatures are warm. Open design of upper part provides optimal ventilation of the foot.